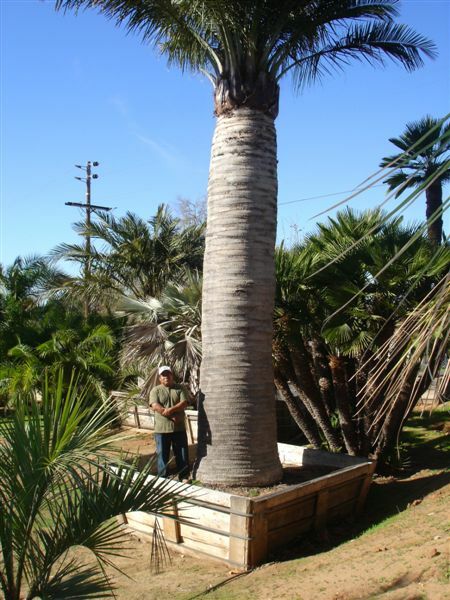 The Chilean Wine Palm, Jubaea chilensis, is a colossal species that is best known for the fact that it has the thickest trunk of any known palm species. Native to the foothills of the Andes Mountains in central Chile, this palm gets to a height of 6o feet, perhaps taller, and has an extremely thick, columnar trunk. By report, trunks have been measured up to a diameter of six feet across. But, this diameter is variable plant to plant. Domestically grown plants probably have average diameters of three to four feet. Regarding trunk height, it takes many decades to attain a height over twenty feet. Consequently, it has become one of the most expensive palm trees one can purchase as a large specimen and is a real sign of affluence. It is a very cold hardy species and likes heat and sun. Because of its stature, it requires a good location with lots of room in the garden to afford proper viewing. The Chilean Wine Palm is native to central Chile. There it grows in the low forests in a restricted area near the base of the Andes Mountains. This habitat sees a rather dry climate typical of a Mediterranean climate. 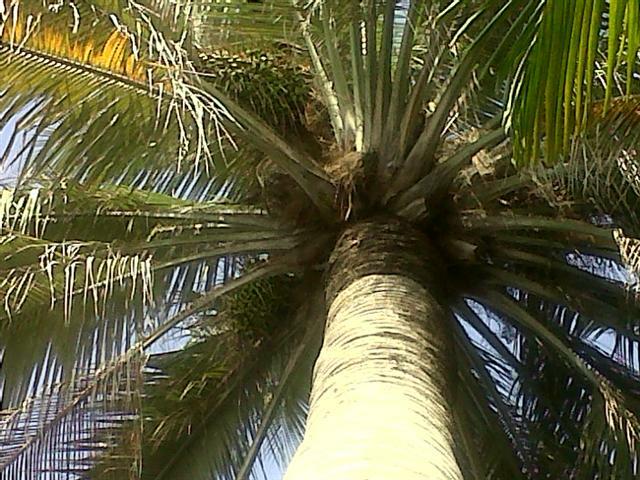 It is felt to have one of the most southern distributions for a palm tree in South America. It can be found at elevations up to about 4500 feet. Populations of endemic plants have markedly decreased in the past 100 years because of collection of the fruits for agricultural and food purposes. Present population estimates by L. A. Gonzalez et al. are that there are 120,000 plants in habitat, or equivalent to only 2.5% of the population at the turn of the century. This is a monotypic genus. There is only one species known to exist. Little is known about the derivation of the genus name "Jubaea", but perhaps it has its origins from the word "Juba", a city in Sudan, Africa. The species name "chilensis" refers in Latin to the country of natural origin. Synonyms and presently unused names include "Jubaea spectabilis", "Cocos chilensis", and "Juania spectabilis". The trunk of the Jubaea chilensis is its trademark. It is the thickest trunk of any known palm species. Estimate average trunk diameters are typically three to four feet and often quoted to be up to six feet. Interestingly enough, when one plants a very juvenile Chilean Wine in the garden, before the plant establishes any meaningful height, it establishes trunk diameter. Therefore, one may see a tree that is ten years or more of age, is quite thick at the ground, but is not yet much above head height. Trunks are gray in color and, from a distance, appear to be smooth. But, on close inspection, one can see leaf scars that are diamond in shape. Sometimes trunks will bulge in the central area (from the ground) and at other times the trunk may taper below the crown of leaves. The third picture immediately below shows how thick the trunk is with overall height not being that great. Once the plant has attained or nearly attained its mature diameter, vertical trunk is formed. The juvenile plant below shows a wide trunk yet a very short palm. Sequential pictures below show establishment of taller trunks over many decades. The last picture shows an extremely large specimen. Note the person standing near the base of the tree. Trunks in habitat have been known, over many decades, to get up to 60 feet with reports of even greater heights on the tallest ones I have personally seen old Jubaeas in domestic plantings that are approximately forty feet tall. But, taller specimens do exist. As mentioned above, trunks of the Chilean Wine palm are nearly smooth. This continues from the ground right up to the base of the leaves. When one inspects the trunk closely, an interesting pattern of old leaf scars is seen on the trunk. This is characteristic of this species. Note in the close up (second photo below) the flattened "diamond shape" to the old leaf scars. This diamond shape is not by itself unique. But, the combination of the thick, smooth gray trunk with the diamonds is typical of a Jubaea. The third picture below is the trunk of a mature Phoenix canariensis. It also has these "diamonds" but is has a more rough texture to the touch and not as smooth as a Jubaea trunk. Trunk diameter of the Jubaea chilensis is variable. All are "thick trunked". But, all are not the same. I think that, independent of hybridization, there are specimens that are more on the thin side and others quite chunky and fat. I also suspect there are "exaggerations" on trunk sizes that are proclaimed without actual measurements. The first picture below appears to be a very thick trunk Chilean Wine, but is actually only about 3 feet in diameter. The second photo below has a trunk diameter of approximately four feet. My son Jesse is standing next to a stout specimen in the third photo below. 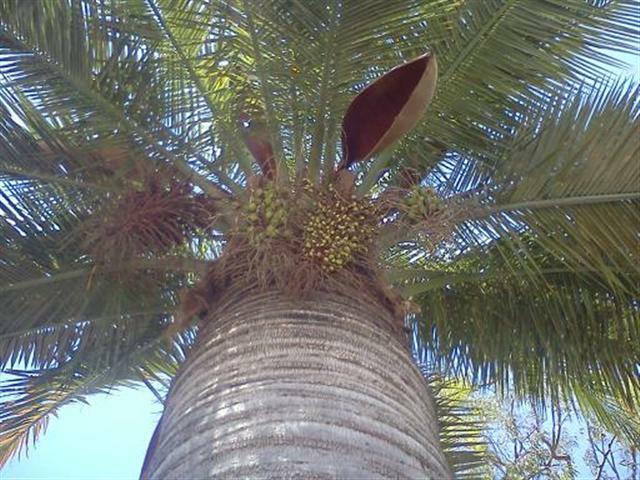 There are several interesting things to note about the crown of leaves of the Chilean Wine Palm. First, the crown is typically wider than it is tall. Secondly, there are typically more leaves in the upper half of the crown sphere than the lower half. Also, note how the trunks are clean of any old leaves hanging down. Compared to many other species, old leaves often fall off quickly as they age. On occasion Jubaea crowns seem to have most of the leaves pointing upwards giving a V-shape to the crown of leaves. The actual leaves of the Chilean Wine Palm are about ten to twelve feet long with a very short petiole (bare stem), making the central portion of the crown very thick with leaflets. Leaflets are about two feet long and leaves are slightly keeled or near flat in cross-section. There is minimal arch to a Chilean Wine palm leaf. 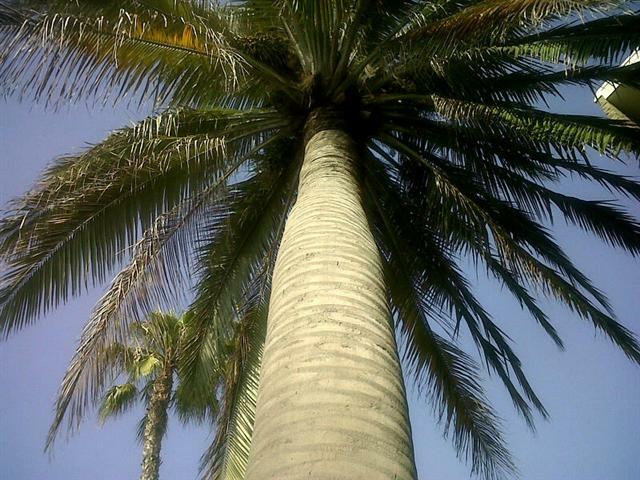 Jubaea chilensis is often confused with another palm, Phoenix canariensis. 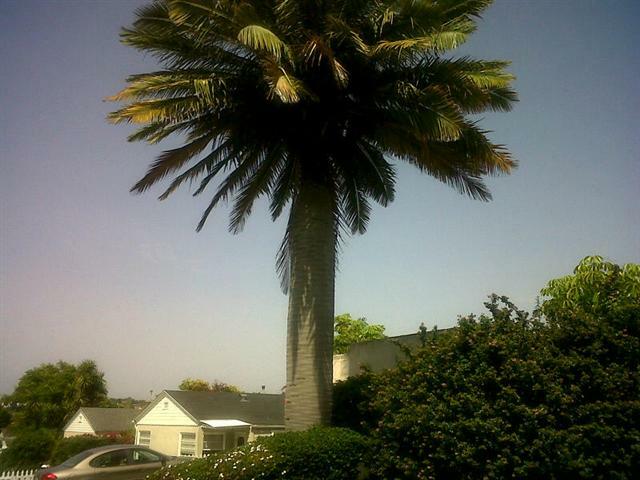 It is not uncommon for me to get calls from people claiming that they have a huge "Chilean Wine Palm", when in fact (after seeing photos) they have a Canary Island Palm. The latter species, in my experience, has more downward hanging leaves than the Jubaea, although this is variable from tree to tree. The biggest difference between the two is that Jubaea essentially has no armor or spines on the stems. Canaries have long wicked spines, often up to twelve inches long. Also, old Canary leaves will clutter the lower crown, often hanging down for months or years before falling off. Jubaea do not do this. Another distinguishing point is that the trunk of the Canary is much rougher with old attached leaf bases (see photo examples above). Also, the leaves of the Canary are much more arched, pointing downwards. Below are two pictures of the crown of leaves of the Jubaea and a triple Canary Palm to the right. On the Canaries, note also the rougher texture tot he trunks. Below I am showing two juvenile plants to give a better look at the leaves of this species. Note the green color, how the leaflets extend deep into the crown with very little bare petiole, and how the leaves are V-shaped or keeled in cross section at this age. 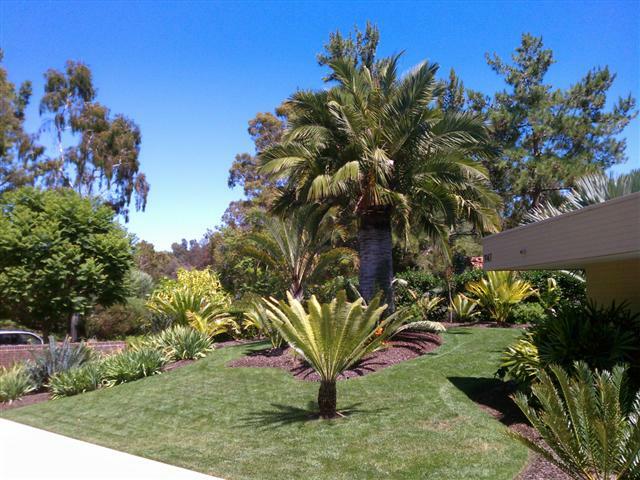 In comparison, the leaves of a Phoenix canariensis are typically flatter and more curved down toward the ground. The leaves of a Butia capitata are more keeled, display more curve and downward orientation, and tend to be more of a blue color when compared to the Chilean Wine Palm. Jubaea chilensis is a monoecious species, meaning that one tree has both male and female flowers and can make fertile seeds without the assistance of another tree nearby. The flowers are branched and hang below the crown of leaves,. Flowers are covered by woody, paddle-shaped bracts. Fruits are quite large, one inch in size or bigger. When mature, they form a tight cluster of yellow colored fruit. A group of seeds hangs in a bunch because of the branched flower. Although I don't know for sure, I've heard of people eating the fruit. Animals such as rats are known to eat the seeds. The fruit is somewhat fragrant. The seeds under the fruit are globular and chestnut brown in color (see photos below). Regarding germination, there are multiple reports of individual techniques of the best method of germination on Internet. What I've found is you either get really good germination or really poor germination on a particular batch of seeds. I've seen this multiple times myself and heard it from others. Therefore, sometimes you get next to zero germination. I think the explanation for this is not just that such seeds were old or dried out. Rather, I think there are some trees that produce seeds that germinate well and others that do not. This seems to defy scientific explanation, but is what I've observed. So, if you want to get good germination, collect seeds from a tree that you've heard someone else had good luck with. When you get a good batch of seeds, I've found a germination rate of 80% is quite common. Germination times of three to six months are typical. Single strap leaves result. I've found that bottom heat is not necessary if you have a warm greenhouse to do your germination. It takes about three years to get a good sized one gallon plant. The first two pictures below show clusters of green Jubaea seeds. The third photo shows a seedling with two strap leaves. The fourth and fifth photos show fruit with its yellow color and cleaned seeds. Seed size is a little under an inch. 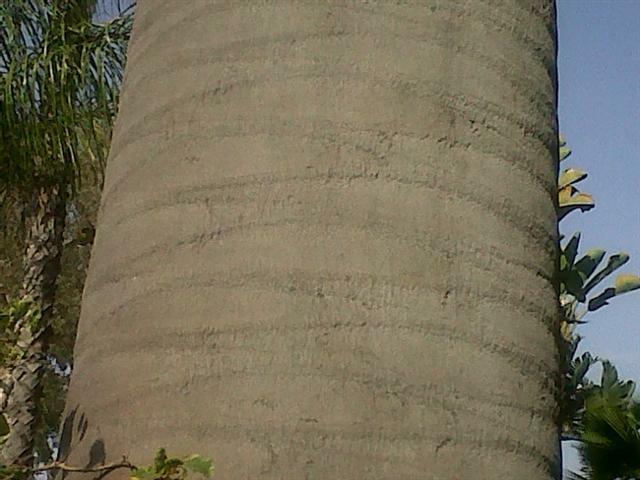 The first principal you have to grasp when you grow a Jubaea is that they are extremely slow growing. It can take eight to ten years for a nurseryman to go from a seedling to a nice 15g plant. This species does grow faster in the ground than in a container, but even with a choice garden location they are still slow. Also, remember that this species puts on trunk diameter before it puts on trunk height. It is not unusual to see a very stock juvenile plant that has a trunk diameter of three feet but only an overall leaf height of six to eight feet with no tubular vertical trunk. As an example, once i sold a Jubaea in a 15g pot to a customer. Five to six years later he invited me to see his garden. With anticipation of seeing a "huge plant" by then in his yard, I was shocked to see a very wide trunked plant that still wasn't head height. This growth rate is typical of this species. Seedling Jubaeas do not like direct hot sun. It is best to grow plants such as the one gallon above in filtered light and when they get larger, slow introduce them into direct sun. As a plant gets larger, it must be in full sun to flourish. They enjoy heat and are quite cold tolerant. In drier areas of the country, Chilean Wine Palms have tolerated temperatures of 15 degrees F. They like to be on the drier side when it is very cold. In humid parts of the country, the cold tolerance is not as low. Very warm and humid area such as Southern Florida or far south Texas may have difficulties with Jubaea because of rot problems. 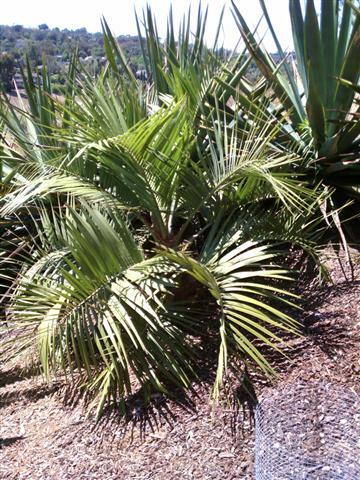 As mentioned, the Chilean Wine Palm like sun and heat (dry heat) and prefer a good draining soil. They can grow in clay soils if drainage is adequate. Average watering seems to suffice. As mentioned above, Jubaea are very slow growing. The following photos will demonstrate this. The first picture below is a 5g plant. It takes about 2 to 3 years to go from the seedling below to this plant. The second photo is a 15g plant. it takes another three years or more to go from the 5g to this size. The last plant, a 20 gallon palm, and it takes about three to four more years beyond the 15g to get to a plant similar to the one shown on the right. This slow rate of growth is the reason why it is so hard to find a good supply of larger Jubaea available in nurseries. Nurserymen are leery of spending this much time to produce a sellable plant. Because of the slow growth of Jubaea childensis, hybridizers have successfully crossed this species with Butia capitata, the Pindo Palm. The resulting hybrid gives a thick trunked palm that is much faster growing than the Chilean Wine Palm. As one might expect, the hybrid's leaves and crown look like a cross between the two parents. But, a striking difference is the appearance of the trunk. It is still extremely thick like the Jubaea, but one will notice retained old leaf bases still attached to the trunk almost all the way down to the ground. In terms of growth rare, it is quick growing, probably 3 times faster than the pure Jubaea. Mature height of the hybrid will not be as great as the pure Jubaea. 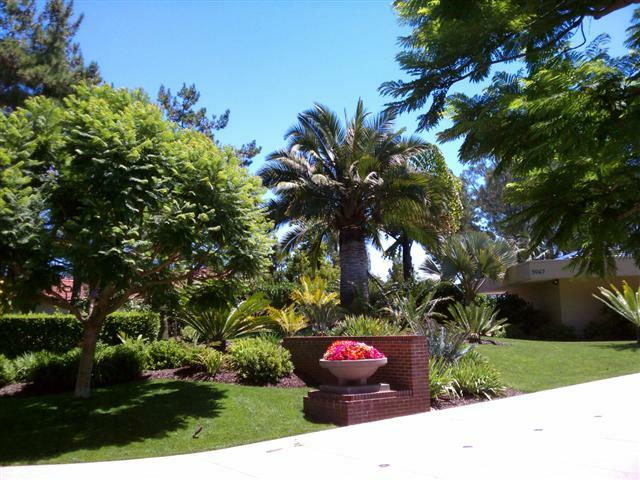 This comes from the fact that mature Pindo Palms are seldom over 20 feet height. This hybrid may also be more tolerant of humid conditions seen in the southeast U.S. 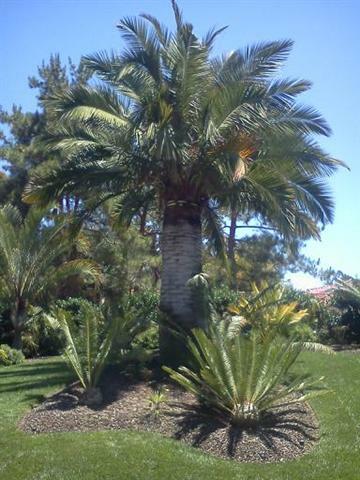 Shown below are a juvenile nursery example of this Jubaea X Butia hybrid. Following are 2 pictures are of one of our that was planted in a garden about four to five years ago. 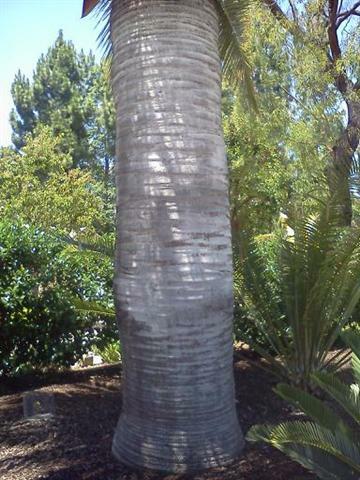 The first picture below is of a specimen Jubaea X Butia at the Los Angeles Arboretum. 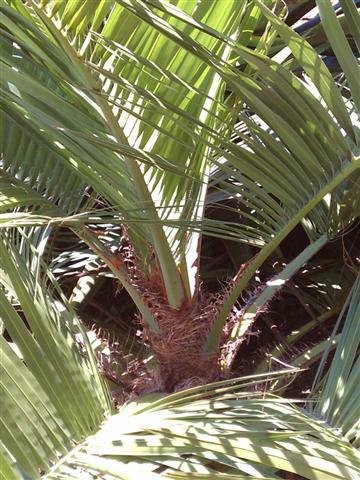 Note the rough trunk with leaf bases compared to the smooth trunk of the pure Jubaea. The second photo shows the trunk of this plant. Standing next to the trunk is past President of the Palm Society of Southern California, David Minks. Note how the hybrid has retained leaf bases on the entire length of the trunk and a very thick trunk diameter. The third photo shows what appears to be this same hybrid in a public garden. As its common name suggests, the sap of this species has been used to make wine. A tree is sacrificed to obtain the sap. When the trunk is cut and laid on its side, the sap slowly leaks from the cut edge and is collected. New cuts are done on a regular basis to keep harvesting the sap. This collected sap has a sweet nature and is used in drinks or fermented to form wine. The seed's fruit is also sweet and reportedly edible and can be used in the preparation of candy. The actual seed (nut) is also edible and can be a source for palm oil. I am unaware of any medicinal usage of this species. As with any plant species, it is always advisable that one verifies the safety of eating any plant material before actually eating it. 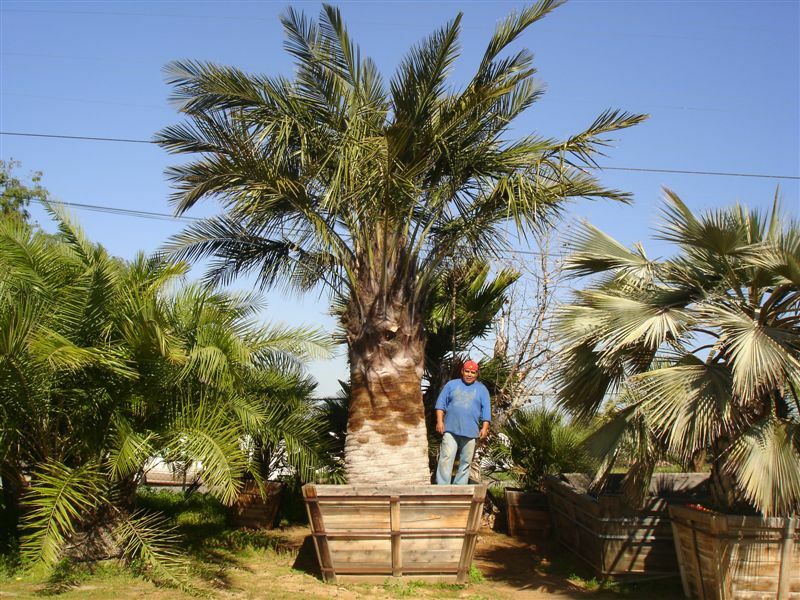 Because of the value of this species, it is not unusual for people in the business of digging and moving palms to seek out specimen Jubaea chilensis. It is well known that this species tolerates being dug and transplanted from garden to garden. Because of their rarity and slow rate of growth, this species commands a higher price than any other large palm. They are much more expensive than the Canary Palm. In fact, moving a big specimen into one's garden is about the most expensive addition he can make. Shown below are several mature Jubaea that were dug from one yard and are awaiting new owners (donated photos). If you read extensively about the Chilean Wine Palm, you will see reference to a blue form. There is discussion that in the most northern native habitats, the Jubaeas are more of a blue color, rather than green. This blue-green color is sometimes seen in plants in botanical gardens or private collections. And, enthusiasts often try to seek of the "blue" Jubaea. At the onset, let me first guarantee you that there is no Jubaea that is blue like a Brahea armata or Bismarckia. But, there are some with a blue tinge to the green leaves. I have read comments that the blue variety might have a thinner trunk or more dependent leaves. 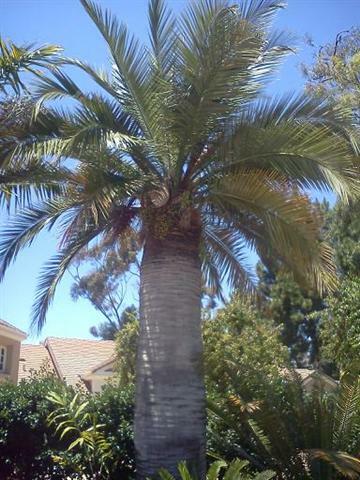 Below are a series of photographs of a specimen Jubaea in the Mission Bay Park area of San Diego. This plant is often used to describe the prototype "blue" Chilean Wine Palm. The third picture (seen elsewhere in this article) is a close up of some green seeds. If you look at the foliage, you can definitely see the blue color. 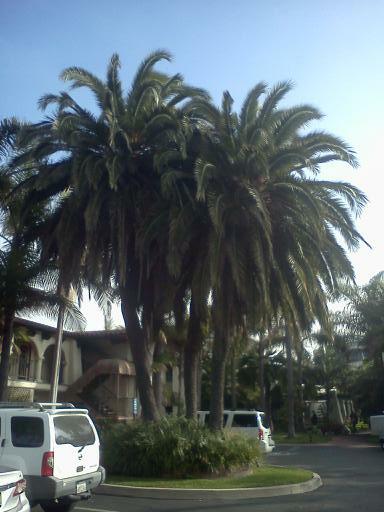 The photo of a grouping of many Jubaea at Mission Bay shows the blue plant next to a lot of mature green specimens. The "blue" one is the farthest plant to the left in the corner. You be the judge as to how different appearing the blue variety actually is. Jubaea chilensis really deserve adequate space in the garden to thrive and look their best. This also gives one the opportunity to see and appreciate this huge palm. They are one of the most spectacular species one can use in the landscape. It is amazing how satisfying it is to view this palm from a distance of 100 feet or more. And, like a magnet, it draws you in to inspect it more closely and actually slap the thick trunk. At an International Palm Society meeting years ago, three past Presidents were needed, all holding hands together, to encircle a large Jubaea at the Lotus Land Botanical Garden in Santa Barbara. Being President at the time, I was one of those individuals. Perhaps some day I'll retrieve a copy of the photograph to show this. 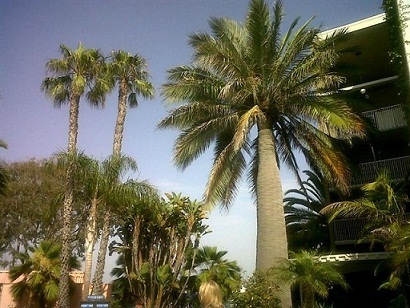 The third picture below is an example of a large Chilean Wine Palm planted right up against a house. Note how close it is to the roof. this would not be an ideal location for planting. Better would be in a large open area of the garden. If there was ever a test of patience, a fine example would be waiting for a planted Jubaea chilensis to mature into a spectacular specimen. It has been said that, when you plant a juvenile tree, you are doing so for you children or perhaps even your grandchildren. This may in fact be true. Some people have the resources to obtain a large specimen and enjoy it from day one. If you are not this lucky, plant a small one. It will provide one benefit of getting older; your palm will look better as both of you age. Jubaea chilensis is a very prominent thick trunked palm tree that appreciates plenty of room to show off its stately appearance. It's hallmark is the huge diameter trunk, easily up to or greater than four feet in diameter. It is very slow growing. This species enjoys heat and sun. It takes one to two decades to get a large specimen plant. Means of distinguishing the Chilean Wine from other thick trunked palms are discussed. This palm can be used in domestic or commercial plantings and is an ideal species for a botanical garden. Hybridization of this species with other genera does exist and the hybrid of Jubaea X Butia gives a thick trunked palm that is faster growing. 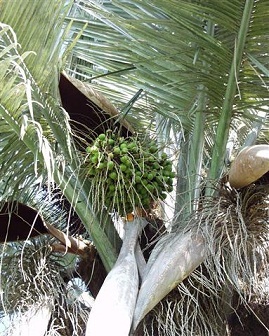 Large specimen Jubaeas are sought after by palm diggers because of their value and high rate of successful transplanting. Jubaea chilensis is an ideal palm for dry, hot localities like Southern California but may have difficulties in more tropical, humid areas. Native to Chile, native populations of Jubaea have been declining over the past one hundred years. Although it takes a long time to get a specimen like some of those illustrated here, if you really want one you must get the size you can afford and plant it. They are easy to grow and you'll be glad you made the effort as time passes.